It’s important to create some kind of space where online conversation and collaboration can happen before, during, and after a THATCamp. We offer hosted THATCamp websites here on thatcamp.org, but you can also build a THATCamp website with WordPress on your own server or you can use a commercial third-party service such as Tumblr, TypePad.com, or WordPress.com. Anyone who registers a THATCamp gets a site on thatcamp.org to keep our list current, although you can use a different site if you like. Post a request on the forums to have the URL for your thatcamp.org site pointed to a different, external site. To edit your site on thatcamp.org, go to [yourdomain].thatcamp.org/wp-admin — you will see the WordPress Dashboard. You can also log in (or out) of your site using the log in / log out link in the sidebar of the THATCamp site that was created for you when you registered your THATCamp. Do make sure that you set the correct date and location in the THATCamp Setup menu on your Dashboard; this will ensure that your THATCamp is listed properly in our THATCamp Directory. Everyone who registers a new THATCamp has a website on thatcamp.org automatically created for them with a URL such as mycamp2013.thatcamp.org. You do not have to use this website, but we provide it as a service. Once you have set the correct date and location in the THATCamp Setup menu in the thatcamp.org site (which will ensure that your THATCamp is listed properly in our THATCamp Directory), you can redirect the URL of the thatcamp.org site to your stand-alone external site. To do this, go to Tools –> Domain Mapping in your thatcamp.org site and enter your site’s domain, e.g., mythatcamp.org. That way, everyone who visits mycamp2013.thatcamp.org will be immediately redirected to mythatcamp.org. The famous WordPress software, available from WordPress.org. See also their Installation Guide. If you’re a total WordPress newbie, there are some great video tutorials on the basics available at this link. The THATCamp logos in various formats. See our page on designing a logo for guidance on how to customize these logos into one of your own. A WordPress theme. You can pick your own theme, or use one of the THATCamp themes we have made: see below for instructions. A registration or application form: see below for instructions. All THATCamp themes and plugins are available for download on GitHub at github.com/chnm/. These plugins and themes are automatically installed on every THATCamp site hosted on thatcamp.org. The THATCamp Registrations plugin accepts registrations or applications for THATCamps. Much of the information collected by the registration form (such as “organization” and “title”) is added to user profiles. The THATCamp themes are “child” themes which need their “parent” themes in order to work: to use THATCamp themes on a standalone WordPress site hosted elsewhere, download both the “parent” theme and the “child” theme from the links below, uncompress the .zip files, then upload the files for both the “parent” and “child” themes to your /wp-content/themes folder. Click on the link to the “parent” theme to see a preview of what it looks like. If you like, you can read more about Child Themes for WordPress. 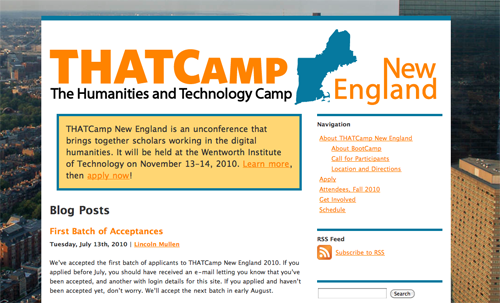 All THATCamp themes include a template called “Campers” that will automatically generate a page that links to the profiles of the site’s users. (In general, THATCamps make all participants users on the site so that they may post to the blog.) First, create a page called “Campers” or “Participants” or what you will by going to Pages –> Add New. Then, in either the Quick Edit or the Edit screen for that page, look for the dropdown box labeled “Templates” and set the template to “Campers.” You’ll wind up with a page such as this Campers page for THATCamp CHNM 2011, with users’ pictures sorted alphabetically by first name linking to their profile pages. Note that you will not be able to add or remove text from the Campers page. Note also that users can either upload pictures directly to their profile on thatcamp.org or register at Gravatar.com with the same e-mail address as they use for thatcamp.org and upload a picture there. Gravatar is a “global avatar” system run by Automattic, the same company that makes WordPress; pictures uploaded there will be available at WordPress.com and other Gravtar-enabled sites around the Internet. To accept registrations for your THATCamp, you will probably want to use the THATCamp Registration plugin. The THATCamp Registrations plugin collects information about THATCamp participants, sends automatic e-mails to registrants, and automatically creates WordPress users. Your site on thatcamp.org will show a menu titled “THATCamp Registrations.” If you are running a WordPress site on another domain, you can download a .zip file of the THATCamp Registrations plugin from github.com. To use the plugin, create a new page called (for instance) “Register” and type the shortcode Registration is closed. in either the Visual or the Text tab. This will generate our standard (non-customizable) application form if registrations are open, or will produce the text “Registration is closed” if registrations are closed. Registrations are closed by default; you can open registration on the THATCamp Registrations Settings menu. In your Settings, you can also show or hide certain fields on the registration form, and you can write text for e-mails that will automatically be sent to users whose applications are Pending, Approved, or Rejected. If the field is left blank, no e-mail will be sent. See also our help page on accepting registrations.